Rock and metal’s elite came together on October 24 in Los Angeles for the 2017 Loudwire Music Awards, a raucous celebration of heavy music and the people who make it. Maria Brink of In this Moment and Judas Priest’s Rob Halford perform “Black Wedding.” Photo credit: Matt Stasi, 2017 Loudwire Music Awards. Host Chris Jericho of WWE and Fozzy masterfully wrangled the night’s performances, awards, and tributes into a thundering freight train of laughter and music. From an opening set with Rob Halford and In This Moment to the night’s closing four-song throat-punch by Avenged Sevenfold, fans in the crowd rocked out to over 15 songs by a half dozen bands. Musical tributes came fast and furious, including two homages to Chris Cornell with Nothing More playing “Show Me How To Live” and Halestorm covering “Fell On Black Days,” Power Trip (with Jamey Jasta) covering Motorhead’s “We Are The Road Crew,” Anthrax covering “Carry On My Wayward Son,” and Halestorm also performing “Cherry Bomb” with Lita Ford herself. Jericho oversaw the presentation of devil horn-shaped awards, molded from the hand of Black Sabbath’s Tony Iommi, in between performances, granting fan-voted honors to Zakk Wylde for Best Guitarist, Iron Maiden’s Steve Harris for Best Bassist, Gojira’s Mario Duplantier for Best Drummer, and Linkin Park’s Chester Bennington for Best Vocalist. Avenged Sevenfold took home awards for both Metal Album and Metal Artist of the Year, while Stone Sour clinched Hard Rock Album and Artist of the Year. 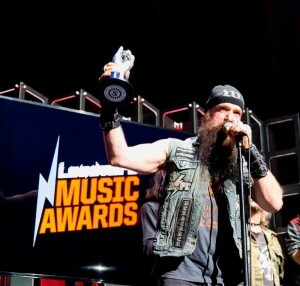 Zakk Wylde accepts the “Best Guitarist” Award. Photo credit: 2017 Loudwire Music Awards. Three metal gods accepted achievement awards over the course of the night, including Iommi, Sammy Hagar, and the original metal god himself, Rob Halford. 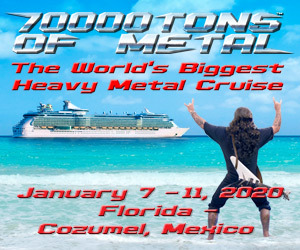 Other old school presenters included David Ellefson, Joey Kramer, Steven Adler, Rex Brown, Vinnie Paul, and the boys from Anthrax representing New York City at this otherwise very Los Angeles event. Anthrax, Avenged Sevenfold, and Body Count all crushed the crowd with strong metal performances that stood in contrast to the more melodic rock offered by Starset and Nothing More, although the latter impressed with an intense cover of Skrillex’s “First Of The Year,” while Starset used an extravagant spacesuit-themed production to awe the audience. For fans in the crowd and those watching on AXS TV at home, the Loudwire Music Awards was everything it promised to be – loud, silly, and full of appreciation for everything and everyone in the heavy music world. For a full list of nominees, winners and video from the show, head over to Loudwire.com.